Why Do Some Dogs Watch TV? Have you ever seen a dog watch television? Whether or not dogs show interest in the TV comes down to their individual personalities and breed mixes. According to Nicholas Dodman, a veterinary behaviorist at Tufts University, dogs can definitely perceive images and sounds coming from the television. How they react to them is another matter! When dogs watch TV, what do they see? A 2013 study published in the journal Animal Cognition found that dogs could visually identify images of other dogs among pictures of humans and other animals. They are also able to recognize on-screen animals and familiar sounds such as barking coming from the set. However, their unique vision means that although they can recognize televised images, they see them a bit differently than we do. When dogs watch TV, they perceive only colors on the yellow and blue spectrum. They have dichromatic vision while humans see the full range of colors. To dogs, every color appears yellow, blue, brown or gray. 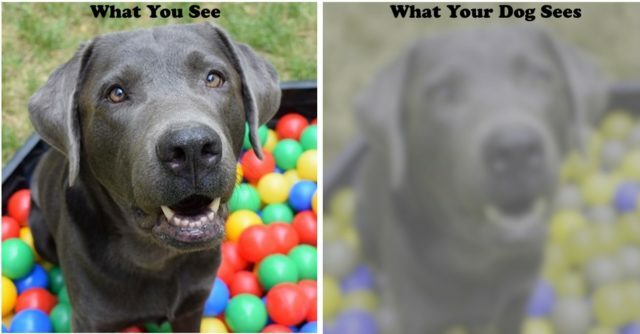 To give you an idea of what dogs see, the following photo was run through a Dog Vision image processing tool. Notice how the multi-colored balls all appear yellow, blue or gray to a dog. Despite their poor color perception, dogs register moving images more quickly than humans. This may explain why modern televisions are more likely to capture their attention. Older sets show fewer frames per second. According to Dodman, this would appear to a dog to be flickering like a “1920s movie.” HDTV, on the other hand, has a much higher number of frames per second, making it much easier on the eyes of TV-watching dogs. Personality makes all the difference. Biology aside, whether or not dogs watch TV and react to its contents depends largely on their individual personalities. Breed may also play a role in how dogs react to television. Hounds are scent-driven and less likely to care above moving pictures. Herding dogs, on the other hand, are more likely to show interest in the action on the set because they are bred to watch for subtle movements. DogTV entertains pups using science. Dodman is the chief scientist behind DogTV, an HDTV channel devoted to keeping pups amused when their humans are away. Not only does the programming feature a higher number of frames per second, its colors are set to accommodate dogs’ yellow-blue visual spectrum. Pawrents can choose from different programming “modes,” like relaxation, stimulation, and exposure. Relaxation mode features soothing music, muted colors, and dogs lounging on the beach. Stimulation shows pups splashing into pools, chasing balls and romping in the grass. Finally, dogs in training may benefit from the ringing doorbells and home-related situations of Exposure mode. Do your dogs watch TV? Share your funniest stories and cutest photos in the comments!